This Benimar home is very well priced good sunny position. The present owners have created an open planned home giving a more spacious feel and nicely decorated. This home is sited on Pueblo Fiesta Park. A truly beautiful park located in Mollina village, a well facilitated village with bars, banks, tapas bars and restaurants. There are also supermarkets, shops and an ambulanced clinic, doctors and dentist. Mollina village is only 15 minutes away from Antequera Town. Only 45 minutes from Malaga airport. Buses and trains available. There is a large community of English people both on the park and also in the village so you will feel at home straight away. Benimar 37×12 2 bed with fly screens and shutters. Lounge comes with sofa, coffee table and TV cabinet. Aircon unit. A fully fitted kitchen with oven, hob and extractor, fridge/freezer, washing machine and microwave. Bedroom 2 has single bed, bedside cabinet and under bed storage. Outside spacious decking area with a paved area to the front and rear, trellis on decking for privacy and climbing plants. A good sized gravelled area at the rear with a rotary washing line and large shed. Annual ground rent €3,985 payable annually from January each year. Whilst every attempt has been made to ensure the accuracy of details and contents of the mobile home for sale. These particulars, whilst believed to be accurate are set out as a general outline for guidance and do not constitute any part of an offer or contract. Intending purchases should not rely on them as statements of representation of fact, but must satisfy themselves by inspection of the mobile home itself. 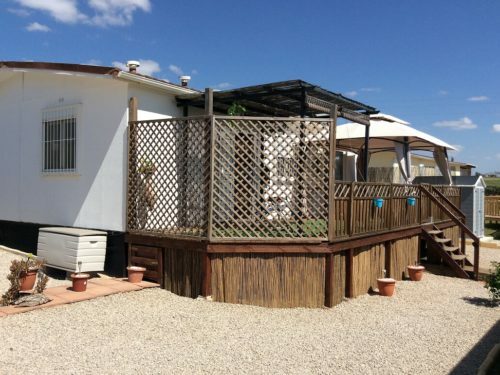 No person of Costa Del Paradise Ltd including our representatives of the Resale Mobile Homes Division has the authority to make or give any representation or warranty in respect of the mobile home. 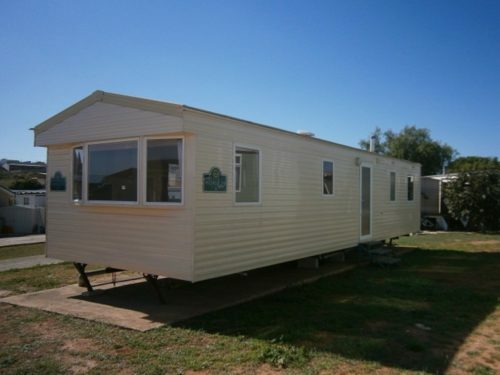 Costa Del Paradise Ltd take in good faith a brief inventory list at point of advertising the mobile home and will not be held responsible for any misunderstandings of inclusions of items included in the agreed purchase of Mobile Home. Costa Del Paradise will not be held responsible for any mobile home, construction, parts, materials or any white goods including boilers. There are no guarantees or warranties with any purchased Resale mobile home.